You can follow the route of the Wall across the country today – from the coast into housing estates; up to high, windswept ridges and down through gentle fields and woodlands. Explore the traces of ramparts, steep ditches, and the remains of forts and bathhouses – and imagine what life was like for the Romans posted on this remote frontier, and for those who lived in its shadow. The western end of the Antonine Wall was marked by a fort at Old Kilpatrick, overlooking the River Clyde. There may have been a harbour here, a supply base for goods brought in by sea. The first visible remains of the Antonine Wall from the west can be seen at Duntocher. On the top of the hill, within the public Golden Hill Park, a small fort and an earlier fortlet have been located and excavated. On high ground to the west of Cleddans Farmhouse (West Dunbartonshire) is the site of a Roman fortlet on the Antonine Wall. The site is not publicly accessible and no remains are visible on the ground today. A section of Antonine Wall ditch and outer mound is visible on Hutcheson Hill, between Cleddans fortlet and Castlehill fort. The site of Castlehill fort lies in open fields on the western edge of Bearsden. No remains are visible on the ground today but the site offers some of the best landscape views along the line of the Wall. A well-preserved section of the ditch of the Antonine Wall and a short section of the stone base of the rampart can be found in Roman Park, on the west side of Bearsden. The best examples of stone structures along the entire Antonine Wall can be seen within a modern housing development in Bearsden. Within the grounds of New Kilpatrick Cemetery, Bearsden are two visible sections of the stone base of the rampart of the Antonine Wall. On the east slope of Crow Hill to the east of Bearsden is the site of a Roman fortlet and temporary camp. The site is not publicly accessible and no remains are visible on the ground today, though portions of both the camp and fortlet are visible on aerial photographs. The site of Balmuildy fort lies on a small plateau overlooking the river Kelvin. Nothing of the fort is visible on the ground today, but traces of the ditch and outer mound are visible in the field east of the farm buildings on the north side of Balmuildy road. In a field to the north-east of Balmuildy fort is the site of a Roman temporary camp. The camp is visible in aerial photographs, but nothing is visible on the ground. Between Balmuildy fort and Wilderness Plantation is the site of Buchley ‘enclosure’. The enclosure is visible in aerial photographs, but no traces are visible on the ground. 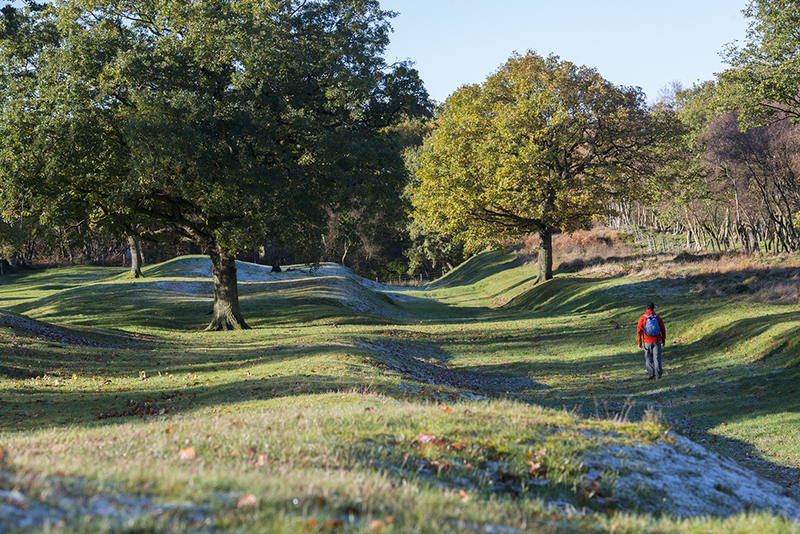 Located about 230m to the west of the fortlet at Wilderness Plantation is the site of an ‘enclosure’ on the Antonine Wall. The enclosure is visible in aerial photographs, but no traces are visible on the ground. Midway between the forts at Cadder and Balmuildy is the site of a fortlet. The site is visible in aerial photographs, but there are no traces visible on the ground today. Just west of the fortlet at Wilderness Plantation is the site of an ‘enclosure’. The enclosure is visible in aerial photographs, but no traces are visible on the ground. Immediately south-east of a sharp bend in the Forth and Clyde Canal at Cadder is the site of a Roman fort. Extensive sand quarrying in the 1940s destroyed both the fort and the remains of a medieval motte which had probably used the ditch of the Antonine Wall as part of its defences. No remains are visible on the ground today. Midway between the forts of Kirkintilloch and Cadder is the site of a Roman fortlet. The fortlet is sometimes visible in aerial photographs, but no traces are visible on the ground today. At Easter Cadder is the site of a Roman temporary camp. The camp is sometimes visible in aerial photos, but nothing is visible on the ground today. Peel Park in Kirkintilloch marks the site of a Roman fort on the Antonine Wall. Auchendavy fort is the only known Antonine Wall fort to have never been excavated. The fort is now mostly covered by buildings and a car park and there are no visible remains of the fort on the ground. To the east of Twechar lies the site of a Roman temporary camp. The camp is sometimes visible on aerial photographs, but there are no visible remains on the ground today. It lies about 300m south of the line of the Antonine Wall. The highest of all the Antonine Wall forts, the fort at Bar Hill has spectacular views in all directions. On a high plateau on the east side of Croy Hill, North Lanarkshire, is the site of a Roman fort, fortlet, and probable temporary camp on the Antonine Wall. Two Roman temporary camps were located at Dullatur about 400m south of the Antonine Wall, between the forts at Croy Hill and Westerwood. Both camps have now been built over, and no visible remains can be seen on the ground today. Beyond the west end of the Cumbernauld Airport runway is the site of a Roman fort, where the Westerwood farm lies today. Immediately east of the Cumbernauld Airport, at Tollpark, North Lanarkshire, between the forts at Castlecary and Westerwood lies one of the longest continuous stretches of the Antonine Wall that can be seen today. At Garnhall, Cumbernauld, to the west of Castlecary, lies the site of two Roman temporary camps, a circular enclosure and possible watch-tower of uncertain date. The site of a Roman fort and annexe can be visited at Castlecary. It is one of only two forts along the wall to have featured stone ramparts. To the west of Seabegs Wood the site of a Roman temporary camp at Dalnair farm. The camp is partially visible as crop marks in aerial photographs, but no traces are visible on the ground. To the east of Seabegs Wood is the site of a Roman temporary camp. There are no visible remains on the ground today. Just west of Rough Castle fort are two ‘expansions’ attached to the south face of the rampart. A second pair of similar expansions is located to the east of Rough Castle fort. Both pairs are best visited in conjunction with a visit to Rough Castle, the best-preserved fort on the entire line of the Wall. If you can only visit one location on the Antonine Wall, Rough Castle fort is clearly the best choice. In the wooded area to the south of the Falkirk Wheel, between Watling Lodge and Rough Castle are the remains of two ‘expansions’ attached to the south face of the Antonine Wall. Both expansions are visible, but they are difficult to distinguish on the ground. Perhaps the best-preserved section of Antonine Wall ditch can be viewed to both the east and west of Watling Lodge along Tamfourhill Road in Falkirk. Between Falkirk town centre and the Falkirk Wheel is the site of a Roman temporary camp. The camp is sometimes visible in aerial photographs, but cannot be seen on the ground today. A well-preserved section of Antonine Wall ditch and outer mound is located amidst housing at Bantaskin, at the western end of Falkirk. Within Falkirk town centre, in an area known as the ‘Pleasance’ immediately south of the Howgate Shopping Centre, is the site of a Roman fort. The fort is now completely built over by houses and a bowling green and there are no traces visible on the ground today. The largest fort on the Antonine Wall was located at the east end of Laurieston. There are no visible traces of the fort on the ground today, but subtle traces of the fort can still be seen in aerial photographs. A short length of Antonine Wall ditch is visible between Old Polmont Church and the M9 motorway. Parking is available to the south of the church and, from here, a section of Wall is located across the churchyard, just to the north of the ruins of the old church. At the north end of Polmont Woods lies a section of Antonine Wall ditch and outer mound. On the west bank of the River Avon, adjacent to the ski-slope on the east slope of Polmonthill (Falkirk), is the first clearly visible section of Antonine Wall ditch and outer mound when travelling from the east. Minimal remains of a Roman fort have been identified on the east bank of the river Avon, near the site of Inveravon Tower, but no traces of the fort are visible on the ground today. In a field to the west of the 15th-century Kinneil House you can see the only example of Antonine Wall fortlet remains still visible today. Just east of Bo’ness, partly in the grounds of (private) Carriden House and partly in adjacent farmland, lie the remains of the easternmost fort associated with the Antonine Wall.